I would like to thank you for providing us the opportunity to have a fantastic week fishing and exploring the Monte Bello Islands. A number of the boys hadn’t previously caught game fish, which they can now cross off their bucket list and with all their photos, even have the proof. Everyone enjoyed trolling the reef structures, catching Spanish Mackrel and the bottom fishing was fantastic with lots of Red Emperor, Rankin Cod and Coral Trout amongst our catch to take home. The food and meals provided over the week was plentiful and fresh. The drinks were kept topped up and cold (a must for the boys). The trip was the best way to spend a week, seeing whales, turtles, birds and stunning sunsets. A great reminder of how lovely it is to get back to nature. 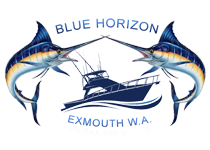 I would like to thank you and your crew for a rewarding and enjoying week aboard Blue Horizon. Under difficult tide and weather conditions both you and your team performed with skill and excellent knowledge to put us on great fishing grounds, allowing us to obtain full fish quotas for the trip. The Montebello Island trip is an experience of a lifetime with beautiful scenery, history and made comfortable aboard you vessel. Anyone with a sense of adventure and a love for fishing should take the opportunity to experirnce this trip. Booking and faciliating the trip was made easy with the friendly and helpful office staff too. 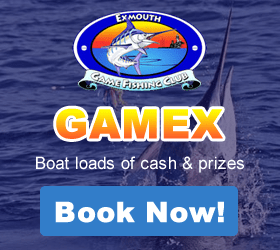 I had the wonderful experience of taking out the Champion Angler Tag and Release Billfish in Gamex 2006. For a few years now my fiancé, Ronnie and I have been competing in Gamex with Steve and his crew, but 2006 was definitely our year. As always the crew, Steve, Damien, Shea and Tamina were excellent. Gamex 2006 was just a fish bonanza, let alone the main catches of marlin and sailfish, we also caught numerous, wahoo, mackerel, tuna, dolphin fish and even a cobia. For me the thrill of catching 10 marlin and 1 sailfish was a lifetime experience. Fortunately for me, unfortunately for Ronnie, he caught a very bad flu, and let me have the fish. He did come away with 2 marlin though and also a very eventful hook up of 4 dolphin fish at once, which for the crew was a piece of cake to organize the mayhem, but had Ronnie and I cringing at what multitude of tangles we could create. Thanks again to Steve and his crew, an excellent experience and as always a pleasure to fish with! !